Often an ancient object is bound to a value that goes beyond its material aspect. It often happens when it is delivered to me an object to be restored that the customer will tell me of the memories and emotions that bind to that object. When restoring an antique I take into account the link that exists between the object and the people who live it. This premise does not gets nod in any way to the quality of materials used, will the skill of playing techniques that together determine the time of making the value of an object. But I believe that respect for the signs that time leaves on an object (its history) is the condition to differentiate the work of the restorer from that of another specialized craftsman. And ‘This is the approach that I keep in the restoration keeping in mind that often a furniture must be used and therefore must also restore its functionality. In craft practice I try to pay attention to those who are the object’s origins operating so as to restore the original splendor by conservative techniques performed almost exclusively by hand, with period materials and natural products such as organic adhesives, beeswax or shellac. In the case in which it is essential to replace or restore damaged or missing parts, it will go to intervene with the utmost care, using the same materials or the like compatible with the original ones in order to integrate the parts with care reported with those already existing. In the choice of materials and techniques of intervention I have no prejudice against “modernity (anything but), the only constraints that are fixed less invasive possible intervention and reversibility (in the field as possible) of the materials used. Invasiveness: For the disinfection of the two techniques untilizzo objects: one for impregnation (gets wet wood, or other materials with the liquid that kills the worms in the wood and then closes in a sealed envelope impregnated wood), or for fumigation (creating a closed environment with the sealed and fits into a gas in this environment plastic that kills the worms). If I am in the case of an object that has preserved the original film can not use the liquid that might alter but the system for fumigation. Reversibility: the stucco choice to use on a piece of antique furniture keep in mind that using a synthetic stucco that in five years it will be more compact and hard of old wood and probably come away wanting to remove even the original wood. E ‘for this reason that animals use adhesives in the preparation of the grout because if necessary in a few years these can be weakened and removed with hot water. 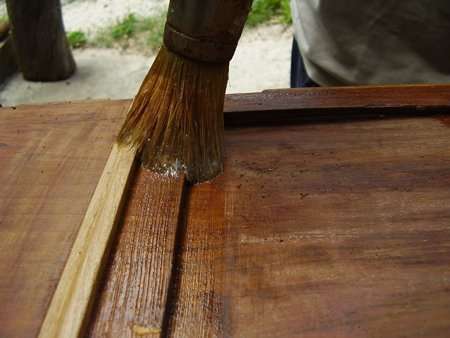 – If the furniture is veneered you switch to manual reset veneer using only natural hot glue.